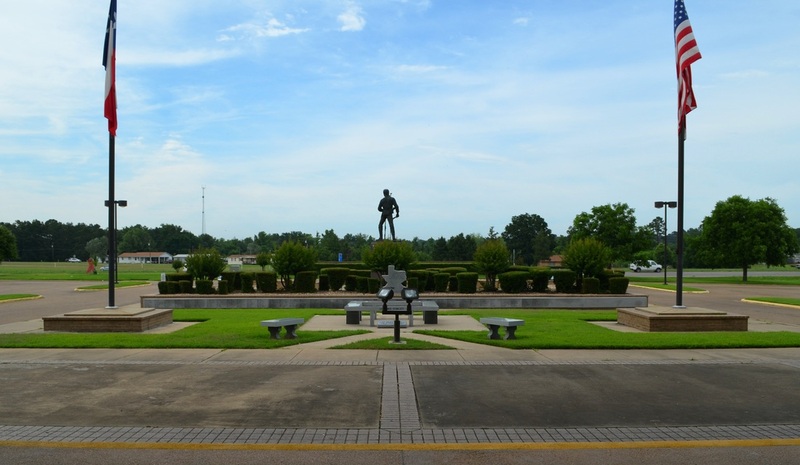 "Bowie County is in the far northeastern corner of the state, bordered by the Red River on the north, with Arkansas and Oklahoma across its northern boundary and Arkansas to the east. 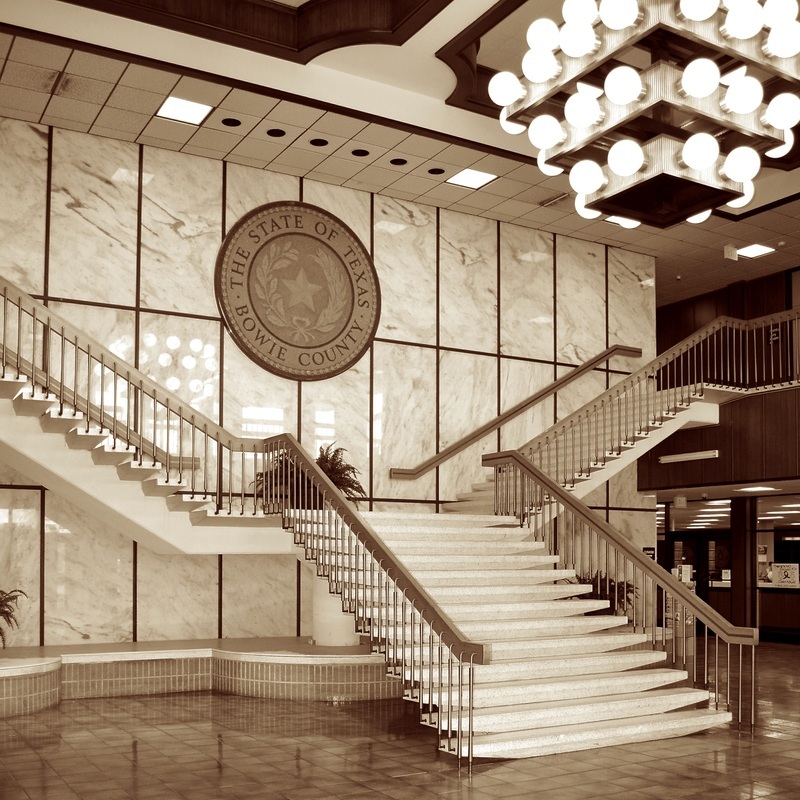 Boston, the county seat, is located near the center of the county, twenty-one miles west of Texarkana, the county's largest town. 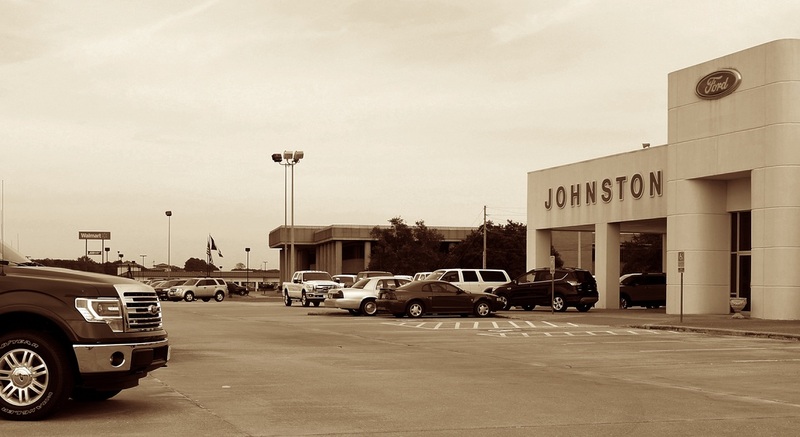 The county occupies 891 square miles of the East Texas Timberlands. The terrain is level to gently rolling; its elevation ranges from 200 to 450 feet above mean sea level. 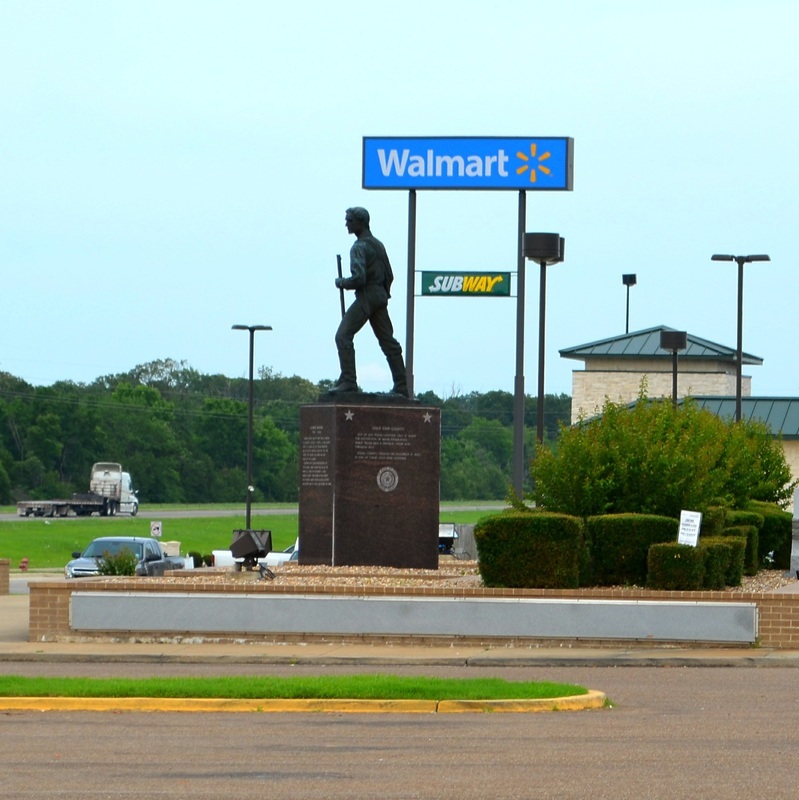 "Because the area of Northeast Texas encompassing present Bowie County was considered by many to be part of Arkansas, it was the site of some of the earliest [U.S.] settlement in Texas. Although the details of earliest settlement in Bowie County are not clear, the area was probably settled around 1820, when Miller County, Arkansas, was organized. 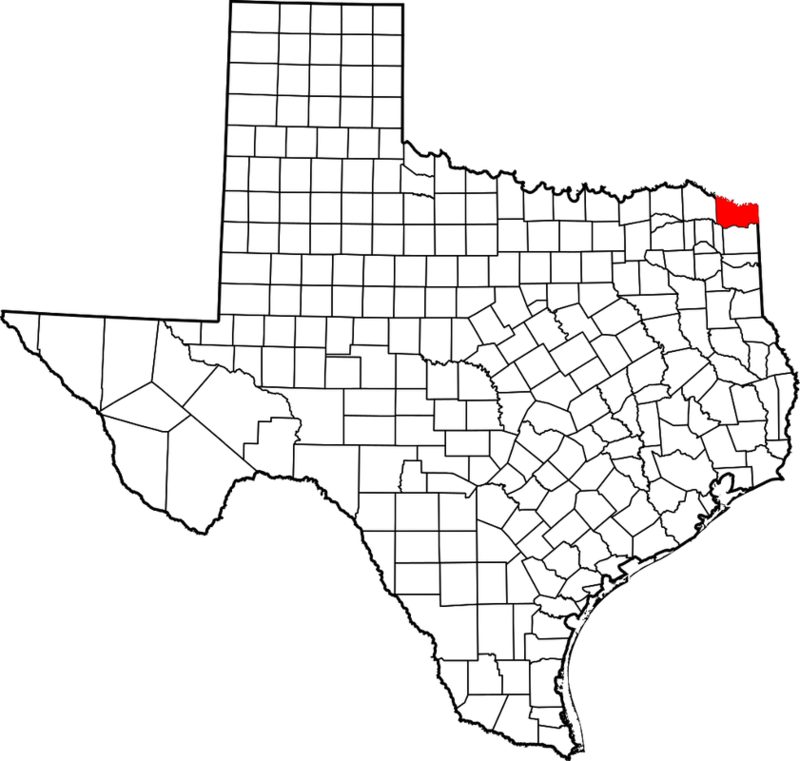 This county encompassed not only what is now Bowie County, but all of the Red River settlements. When the Convention of 1836 met at Washington-on-the-Brazos, the Red River settlements were represented. That year Red River County, which included all the territory now in Bowie County, was established. 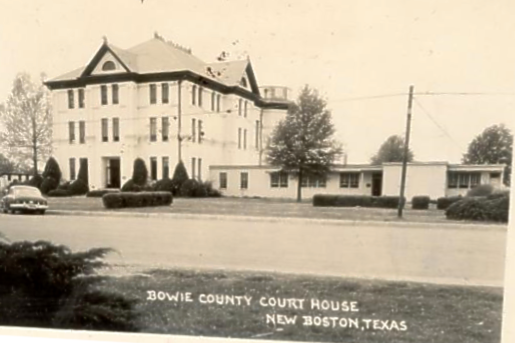 "Bowie County was demarked in December of 1840 and named for James Bowie. As originally delineated, the county included all or part of the territories of present Cass, Titus, and Morris counties. In 1846 the county was reduced to its present size and boundaries with the establishment of Cass and Titus counties. DeKalb, in the western part of the county, was designated temporary county seat, while a commission was appointed to choose a more appropriate permanent site. The commission chose the town then named Boston (see Old Boston), which became the county seat in 1841. 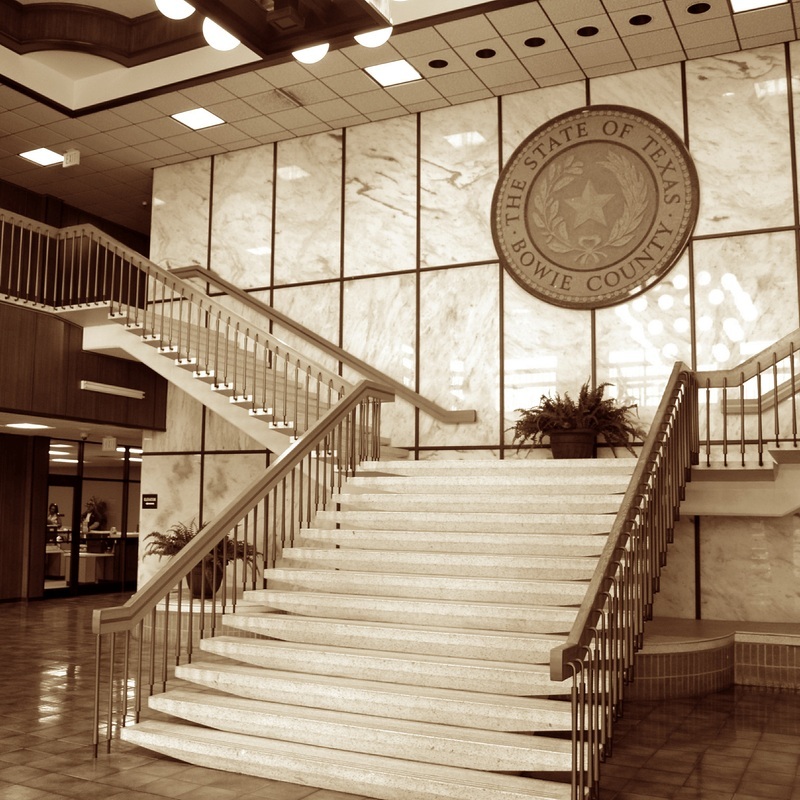 In the mid-1880s the citizens of Texarkana conducted a successful campaign to make Texarkana the county seat. About five years later residents of the western and central parts of the county campaigned successfully for yet another county seat, this one to be at the geographic center of the county. 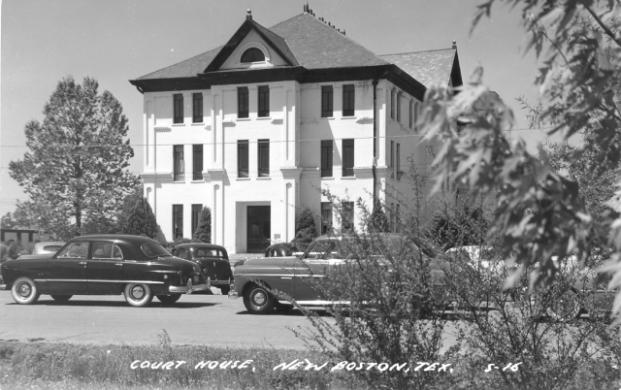 The new courthouse was constructed in 1890, and the town that grew up around it was named Boston. 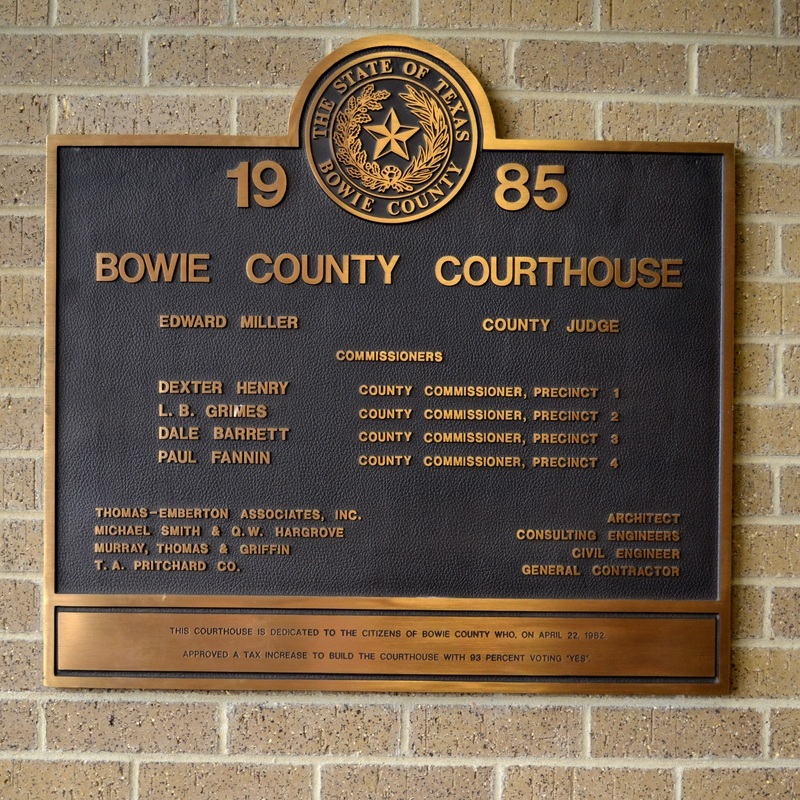 [To further confuse matters, in 1985 the current Bowie County Courthouse was constructed in New Boston, a town north of Boston (not to be confused with Old Boston), which is still the designated county seat; albeit without the county courthouse!]" 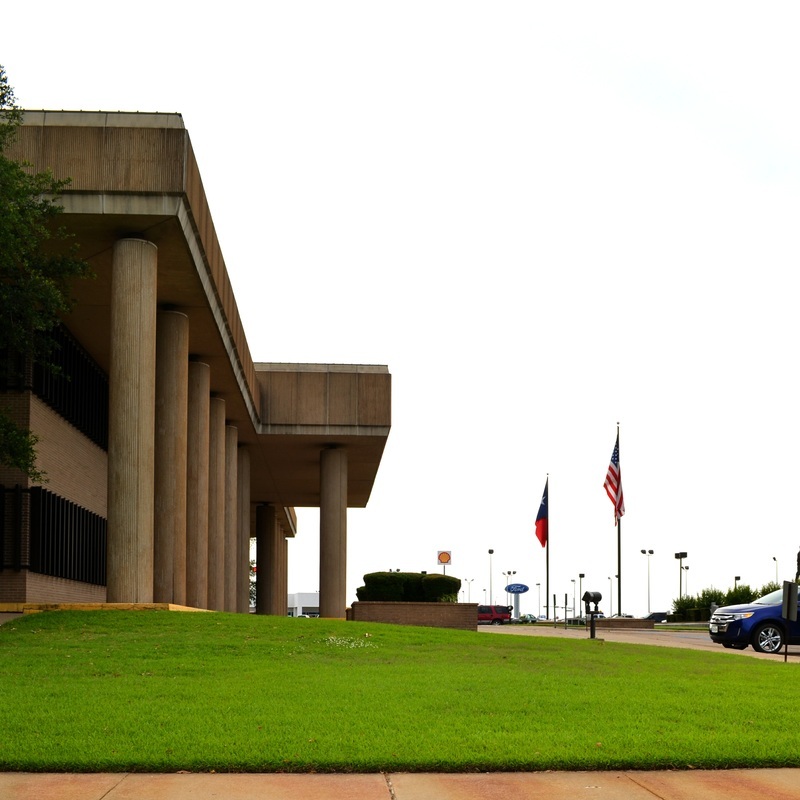 I visited Bowie County and photographed the courthouse in New Boston on Friday, June 6, spent the night in nearby Texarkana, and returned on Saturday, June 7, 2014. 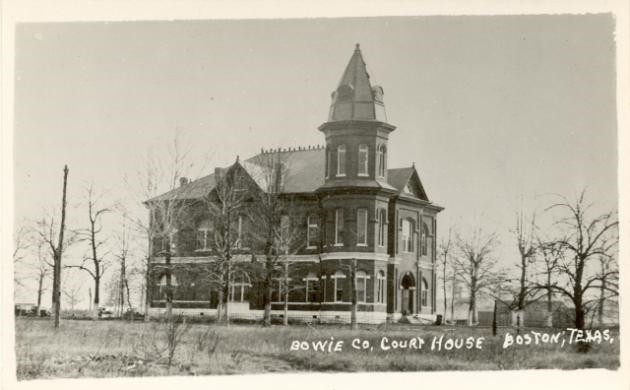 The historic Bowie County courthouse, built in Boston, had an octagonal tower on the northwest corner of an otherwise, bi-laterally symmetrical plan. At some point the tower was removed, probably for structural reasons, as was often the case with 19th century courthouse towers in Texas. Or, it was hit by a tornado, the second greatest threat to these towers. By the way, those aren't birds on the central ridge of the roof. 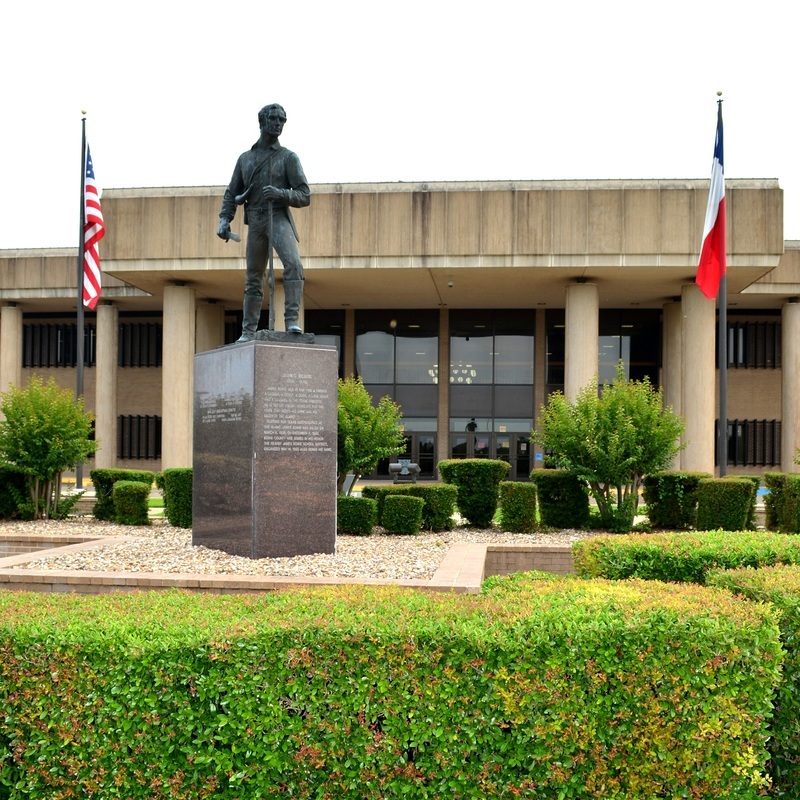 A statue of Jim Bowie stands guard in front of the courthouse, which faces north. 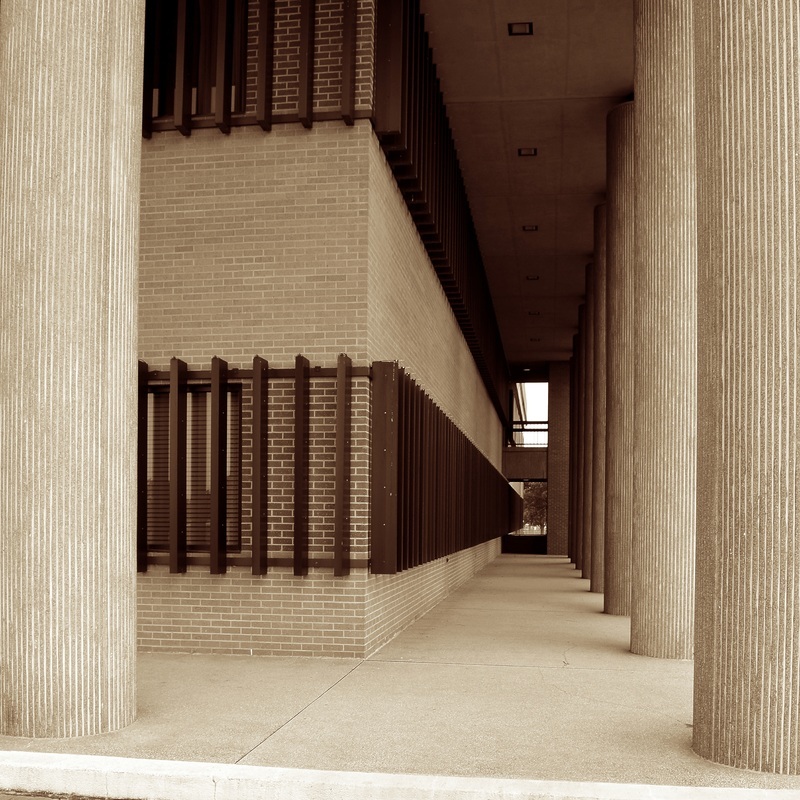 The courthouse affects a contemporary classical "look" without success. 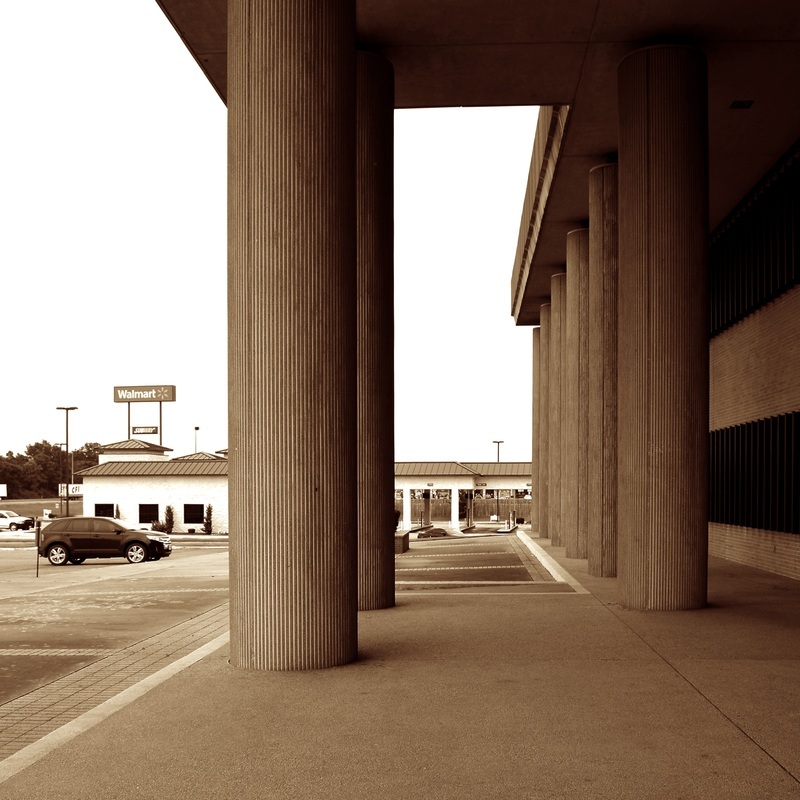 In particular, without a "base," the building appears to be sinking into the ground.